G. M. Berndt, R. Steinacher (éd. 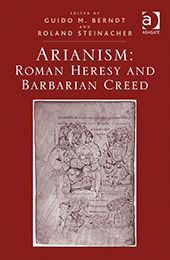 ), Arianism: Roman Heresy and Barbarian Creed, Farnham, 2014. Contents: Preface; Introduction: framing the historical and theological problems, Hanns Christof Brennecke; Ulfila und der sogenannte gotische Arianismus, Knut Schäferdiek ; Ulfila and the so-called ‘Gothic' Arianism - English summary, Knut Schäferdiek ; Was Ulfila really a homoian?, Sara Parvis; Sabas: ‘orthodox' or ‘Arian'?, Paul Parvis; The Homoians, Uta Heil; Deconstruction of the so-called Germanic Arianism, Hanns Christof Brennecke; Vulfila pontifex ipseque primas Gothorum minorum, sed non apostolus eorum. Vulfila, bishop and secular leader of his people but not their apostle, Herwig Wolfram; Barbarian ‘Arian' clergy, church organization, and church practices, Ralph W. Mathisen; Germanic language and Germanic Homoianism, Brendan Wolfe; The non-archaeology of Arianism - what comparing cases in Carthage, Haïdra and Ravenna can tell us about ‘Arian' churches, Ralf Bockmann; The ecclesia legis Gothorum and the role of ‘Arianism' in Ostrogothic Italy, Guido M. Berndt and Roland Steinacher; Arrianorum abolevit heresem: the Lombards and the ghost of Arianism, Piero Majocchi; Arianism in Africa, Robin Whelan; Arianism and ethnic identity in 6th century Visigothic Spain, Manuel Koch; The Homoians in Gaul, Uta Heil; Britain: approaching controversy on the western fringes of the Roman Empire, Meritxell Pérez Martínez; Conclusion: the elusive nature of an orthodox heresy, Yitzhak Hen; Bibliography; Index.